If the school district(s) close then the church activity(ies) for that day will be canceled. 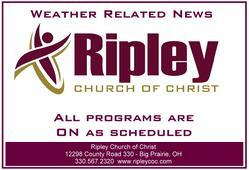 Worship 1 and Sunday School programs are cancelled but Worship 2 will take place at 11:00 am (note the time change). Total cancellation of all programs / services. Announcements will be braodcast on WKLM (95.3) and WQKT (104.5). We will also post weather related information on our website and send an email through our Happening's list.